A robust health and safety policy is paramount to any organisation, but those working in the education sector will understand the magnitude of responsibility they have to ensure a safe learning and working environment for not only their students and staff but for the many contractors and visitors who may be on the premises at different times of the day. Educational establishments are fairly unique as many will contain a variety of different buildings over one, or sometimes multiple sites, and there will most probably be grounds for sports. These premises will also be host to a multitude of events over the academic year with varying numbers of extra visitors to the site. Add into the equation children of any age and it’s enough to test the hardiest of Health & Safety Managers, however this responsibility usually falls to one or more individuals as just a small part of their normal job role. According to the Health & Safety Executive, you can attribute 55% of health and safety-related accidents to trips and falls, and that percentage is just for the education sector. 90% of those accidents result in a broken bone, and some of them will be life changing for the injured party. Slips and trips unfortunately are inevitable. People fall; it’s human nature. I’m clumsy, I know firsthand. However, that isn’t an acceptable excuse and if the right precautions and measures are implemented, some of those accidents can be prevented. 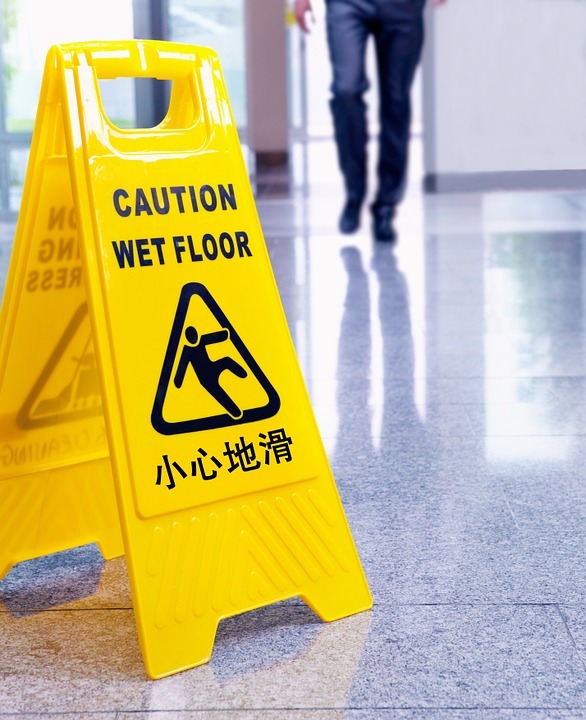 When conducting your regular risk assessments pay particular attention to slip and trip hazards on your premises, both within the school buildings and the grounds. The HSE states the most common areas for these accidents to occur are corridors and outdoor areas, followed by stairs, but this will be different for each establishment. Historical incident records will give you an indication of areas where changes may need to be made. Next, identify who may be most at risk to slips and trips, taking into account staff, pupils and also external visitors to the site. Identify what precautions are currently in place and decide if they are adequate or if additional measures need to be implemented. As with all risk assessments it’s important to document your findings as well as any action taken. You may find you need to change the matting in your entrances to minimise the amount of water being brought inside, or a change to specially designed slip resistant surfaces in high-risk corridor areas may be needed. This can help to provide a permanent reduction in the amount of slip and trip accidents in that area. The approach to slips and trip hazards needs to stretch further than just your risk assessment though, as there are so many people that are exposed to the risk and, as such, they should be involved. Create a policy for your organisation that is dedicated to slips and trips. Start the document with an outline of your organisation’s responsibilities, and then follow it by defining the responsibilities of key groups, such as pupils, caterers, cleaners, teachers and lecturers, maintenance staff and the board of governors. Each group’s responsibilities will relate to their specific area of work and will include points such as reporting spills as a matter of urgency, wearing ‘sensible’ footwear, using the correct cleaning solutions for the type of flooring or simply maintaining a clear desk policy. The way you communicate your policy is key for maximum engagement and you should ensure all stakeholders are trained appropriately. Finally, by keeping an annual tab on slip and trip accidents you can directly attribute a decrease in them to the measures you have put in place and quickly identify any areas of concern in the future. The HSE website contains a fantastic area of their website dedicated to slips and trips (here), and have also produced the leaflet Watch your step in Education, which has several detailed case studies and also practical advice of how to implement changes. Safesmart can help avoid slips, trips and falls with our health and safety consultancy. Our Smartlog software can also be used to do risk assessment for actual out of school trips. This entry was posted in Advice & Answers. Bookmark the permalink. Both comments and trackbacks are currently closed.